I test the recipes for you! Caramello bars have always been one of my favorite candy bars! So when I came across this recipe I thought, let’s do this! Making these blondies was both a good and bad decision. Good, because they were delicious. Bad, because I wanted to eat them all! Luckily I was able to pawn some off…uh I mean give some, to a friend. From what I was told, her family loved them! These bars are super sweet and tasty! Now, just a warning, they may be too sweet for the average person. I cut an 8×8 pan of blondies into 16 squares and you could probably eat half of one of those and be satisfied. I definitely recommend eating one with a glass of milk nearby. If you love sweet treats, caramel, and white chocolate, then you will love these! Bake it or leave it? Bake it! In a medium bowl, combine the cake mix, pecans, butter, white chocolate chips, and 1/3 cup of evaporated milk and mix well. Spray a 9×9 (or 8×8 in my case) pan with non-stick cooking spray. Split the dough in half and press one half down into the bottom of the pan. Try to make sure it’s even. Bake this at 350 F for 8-10 minutes. Pour the melted, gooey, delicious caramel onto the bottom blondie layer and set aside. Take the other half of your dough and press it into a kind of square shape. I put some flour on a rolling mat and rolled it into a square shape. 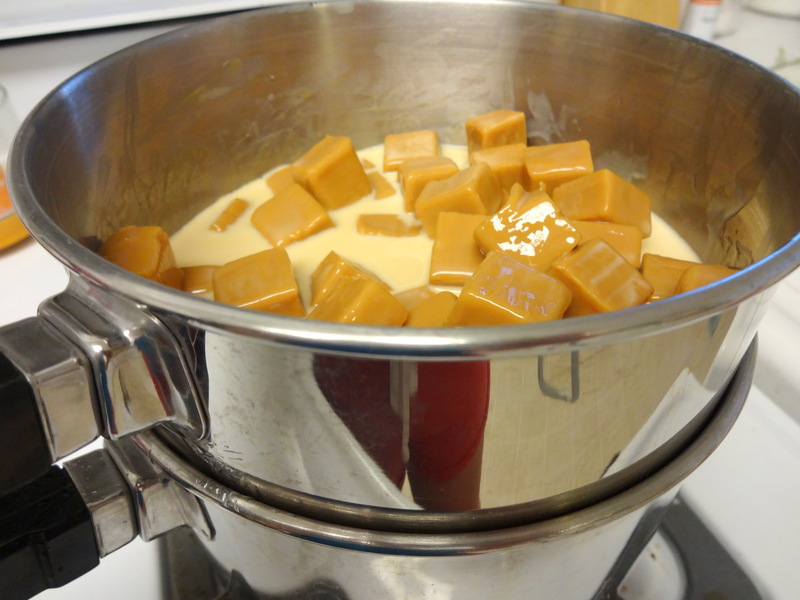 I then just turned the mat upside down over the pan and plopped it on top of the melted caramel. You could also place wax paper under the dough and roll it on that and then just peel if off of the paper and place it on top of the caramel layer. It’s OK if your dough doesn’t completely cover the caramel layer. It will expand while baking. Bake at 350 F for about 20 minutes or until it’s lightly golden brown and firm. Let it cool and then place it in the refrigerator for 1-2 hours to set up. When ready, you can cut your blondies into squares and dust with powdered sugar and top with a broken up Caramello bar! I only used the powdered sugar and Caramello bar for my picture. I think the blondies are plenty sweet without the added sugar on top : ) But it does look pretty! Let me start off by saying this. I love banana cake and banana bread. Who doesn’t? It’s delicious. So when I had a few VERY ripe bananas sitting on my kitchen counter, I knew exactly what to do with them. I searched Pinterest for a tasty and easy looking recipe and came across this one. I had all of the ingredients on hand so I went for it. The result? Super moist and tasty banana cake. It came out better than my banana bread ever has. I will definitely be making this one again! I’m just not sure how I feel about the lemon icing. I think I would make a basic vanilla buttercream or cream cheese frosting to go with it next time. Fun fact, turns out the creator of this recipe is a well known chef in New Zealand. That’s pretty cool. You never know where Pinterest will lead you! So bake it or leave it? BAKE IT! Preheat oven to 170 celsius or 338-350 Fahrenheit (I did 338 degrees F, so cooking time was longer). Line a 23 cm round cake tin (about 9″) with baking paper or prepare cupcake tins (I used an 8″ spring form pan and I skipped the paper step and just buttered my pan). Beat butter and sugar until creamy. Beat in eggs and vanilla, then the mashed bananas. Dissolve the baking soda in hot milk over the stove and add to the mixture. Sift the flour and baking soda over the mixture and fold in. Spoon the mixture into the prepared pan or tins and smooth the top. Bake until a skewer inserted into the center comes out clean and the top is springy to the touch. To make the icing, beat together butter, lemon juice, sugar, and 1/2 Tbsp hot water until creamy (I didn’t use the water). So this recipe has been calling to me for some time now. I first spotted it on Pinterest but was afraid it would turn out to be one of those recipes that doesn’t taste as good as it looks. But I decided to give in to the temptation and lure of the picture and just make it. I am so glad that I did! These things have a lot going on but it all works well together and one flavor doesn’t overpower the other. If you love raw cookie dough, which I do, and chocolate (who doesn’t? ), then this recipe is for you. But just a warning, these are very sweet and delicious. These “bombs” will satisfy your sweet tooth and after just one, you won’t be able to eat any other sweets for at least a day. I think these would be easy, tasty treats for parties or holidays. The recipe makes about 20 “bombs”, you can eat them with your hands, and you can make them ahead of time and just freeze them! So when it comes down to it, bake it or leave it? I say BAKE IT! Using a stand mixer, beat together the sugars until creamy. Add the milk and vanilla and beat to combine everything. Then beat in the flour and pinch of salt until a soft dough forms. Stir in 1 Cup of mini chocolate chips. Line a baking sheet with foil and drop rounded, tablespoon size balls of dough onto lined baking sheet (I used a cookie dough scoop so mine may have ended up a bit larger). Freeze the cookie dough balls for about an hour. Cut the brownies into small, 1 inch size squares. (I think mine ended up being more like 2 inches. Maybe that’s why they were so big). Try to avoid the edges of the pan since they can be a bit more well done. And you don’t want weird crunchies in your “bomb”. Pick up a square and gently flatten it in your hands (I found that this works much better than trying to flatten it on a different surface). At this point you’ll see why it’s important to use fudge brownies rather than cake brownies (they flatten easier and retain their moisture). d brownie and gently wrap the brownie up around the cookie dough. 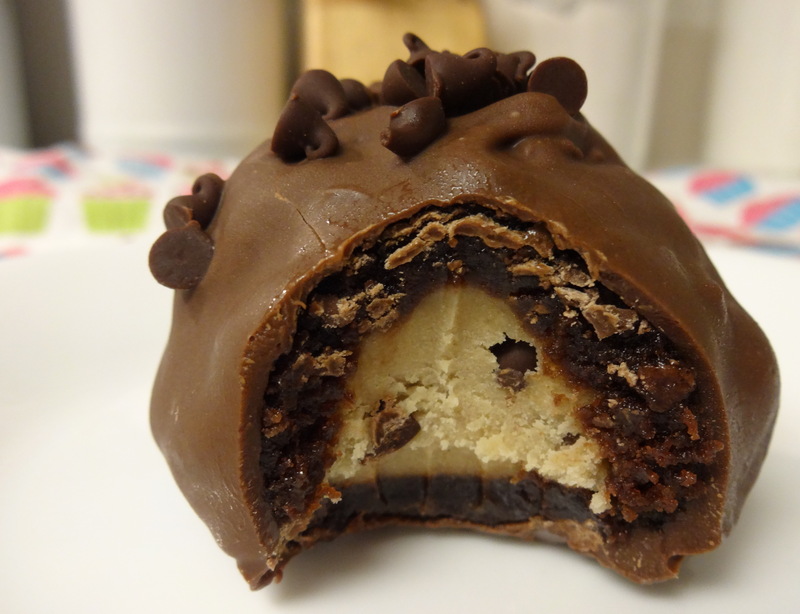 You can kind of squish the brownie around until it fully covers the cookie dough ball. Repeat this with all of the cookie dough balls. Then return the brownie covered balls to the freezer for about 30 minutes. Once the balls are done in the freezer, prepare the chocolate bark or Candiquik according to package directions. Use a fork to dip the brownie balls into the melted chocolate. Make sure you cover the whole thing in chocolate and then let the excess drip off. 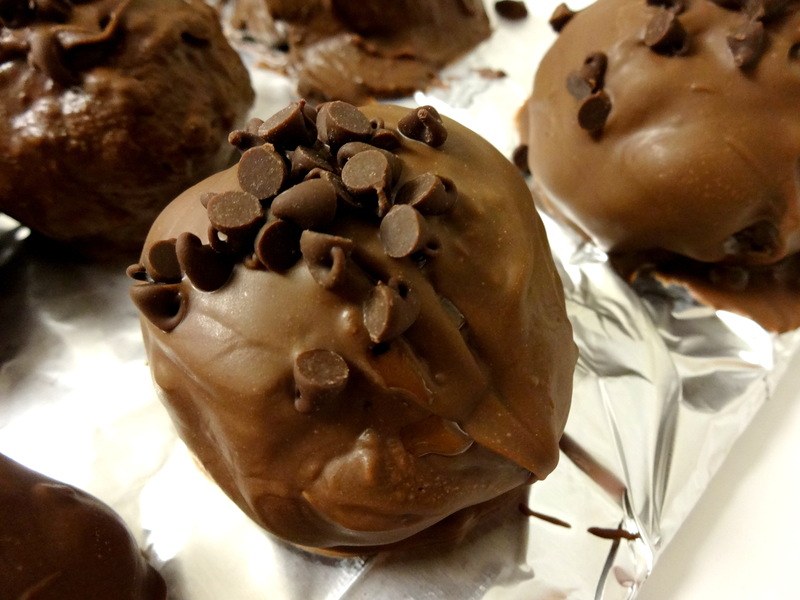 Return he ball to the foil lined sheet and sprinkle the remaining mini chocolate chips onto the chocolate-dipped brownie balls. You can then store these in the fridge or freezer in an airtight container (I prefer the freezer myself). Now go enjoy your Chocolate Chip Cookie Dough Brownie Bombs! Sadly, it did not taste like a maple bar. It didn’t even taste like maple at all! I was so disappointed. This recipe is a pretty easy, straightforward cheesecake recipe with some maple syrup added. As far as cheesecakes go, this one tasted pretty darn good. But if you’re going to call it “Maple” Cheesecake then it better taste like maple. If I were to make it again, I would add some maple extract to give it a some flavor. I would also cook it a little longer. My springform pan was a little smaller than what the recipe called for and I added an extra 10 minutes to the cook time but I think it could have used at least another 5 minutes. All in all, this is a good cheesecake. However, if you’re looking for a “maple” cheesecake, this is not the one for you. If you make some adjustments to the recipe with maple extract, it could be much better. As a cheesecake, I say bake it. As a “maple” cheesecake should you bake it or leave it? I say LEAVE IT. Preheat oven to 350 degrees. In a small bowl, combine the flour and brown sugar. 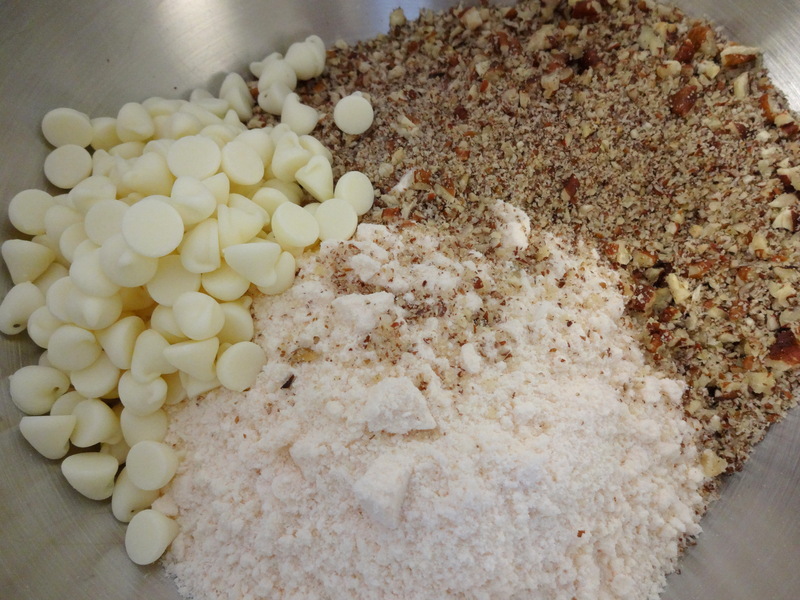 Cut in the butter using a pastry cutter or fork and add the chopped pecans. Press the mixture onto the bottom of a 10 inch springform pan (you can use other sizes, you may need to adjust the cook time accordingly). Bake in a 350 degree oven for 10-12 minutes or until lightly browned. Cool completely. In a stand mixer, combine the cream cheese and mascarpone cheese. Beat until smooth. minutes. Then gently run a knife around the edges of the pan and remove the ring. Let cool for 2 hours and then cover and chill in the refrigerator for 4+ hours. Before serving, whip the heavy cream and Whip-It (if you decide to use this) until soft peaks form. Add the maple syrup and vanilla and continue to whip until the mixture is thick. You can pipe the cream onto the cheesecake or just put a dollop on each slice. Sprinkle with maple flakes or chopped pecans and you are ready to serve! The cheesecake, without the whipped cream, can be made in advance and frozen for up to one month. Lightly butter a 9×13 baking dish and line with a sheet of wax or parchment paper. Butter the top of this paper and then place a second sheet of paper crosswise over the first sheet. You’ll want a big enough piece of paper so that some is hanging over the edges. This will help you pull the lemon squares out of the pan later. Set the pan aside. In a large bowl, combine 1 3/4 cups of the flour, 2/3 cups of the powdered sugar, the cornstarch, and 3/4 teaspoon of the salt and mix thoroughly. Cut the 12 tablespoons of butter into small pieces and add to the flour mixture. Work the butter into the flour mixture using your hands, 2 forks, or a pastry blender (I personally prefer a pastry blender). The mixture should resemble coarse meal. Transfer the butter-flour mixture to the prepared baking dish and press down until it’s about 1/4 inch thick all over and press some slightly up the sides of the dish as well. Refrigerate for 30 minutes. While the crust is in the refrigerator, preheat the oven to 350 degrees F.
Bake the crust until it’s golden brown, about 20-25 minutes (it took 35 minutes for my oven, so just keep an eye on it). While the crust is in the oven, prepare the filling by combining the eggs, granulated sugar, flour and lemon zest in a medium bowl and whisk until smooth. Stir in lemon juice, milk, limoncello, and remaining pinch of salt. Mix well. temperature to 325 degrees F. Stir the lemon mixture, then pour it onto the warm crust. Bake until the filling is set, which should be about 20 minutes. Transfer the pan to a wire rack to cool completely. Grab the wax paper or parchment paper that lines the side of the dish and remove the bars by pulling up on the paper gently. The bars should easily come out of the pan (I waited for the bars to cool in the refrigerator before I pulled the dish out to cut them. If you do this, you may need to use a spatula around the edges of the dish to dislodge the paper). You can then transfer it to a cutting board and cut it into squares. Or you can just grab a fork and enjoy haha. If you want to dress up the bars, you can put some powdered sugar into a sieve and sprinkle the bars lightly with the sugar. You can then serve your lemon squares immediately or refrigerate them wrapped in plastic wrap. They should be good in the refrigerator for up to two days but I highly doubt they’ll go that long without being gobbled up. 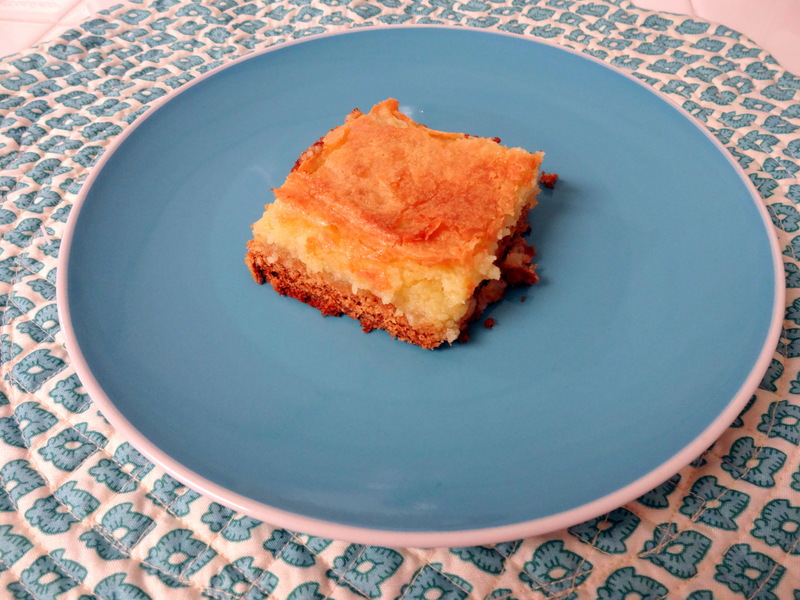 I hope you enjoy these delicious lemon squares! I sure am enjoying mine! I must say, I was quite disappointed. I read rave reviews about this recipe but they must have been eating something different because I sure didn’t love it. For one thing, I think the cook time is a bit long, at least for my oven. I put it in for 40 minutes but the bottom got a bit burned and nobody likes a burned bottom hehe. I must admit, I did forget to check on it though. I got too caught up watching Biggest Loser while baking this. I know I know, who makes butter cake while watching a show about weight loss right? Apparently the message of the show was lost on me this weekend. I just felt that even if I hadn’t burned the bottom, the cake didn’t have a lot of flavor. It tasted exactly like what it’s called, butter cake. I have seen other recipes where they add strawberry cake or chocolate chips, so maybe that would make it better. Or maybe serve it with fresh berries and a scoop of vanilla bean ice cream? But by itself, I’m not a fan. I did enjoy the texture of this cake though, nice and moist. Overall, there’s a lack of flavor and it’s just not worth the calories. So if asked to bake it or leave it? I say LEAVE IT! Combine cake mix, egg, butter and mix using an electric mixer. Press the mixture into the bottom of a lightly greased 13 x 9 pan. Beat the cream cheese until smooth in a large bowl. Add eggs, vanilla, butter and mix together. Add the powdered sugar and mix well. Spread over the cake batter in the pan and bake for 40 to 50 minutes. You want the center to be gooey.